Iron Maiden’s last album of the 1980s was also the last album of their classic era. 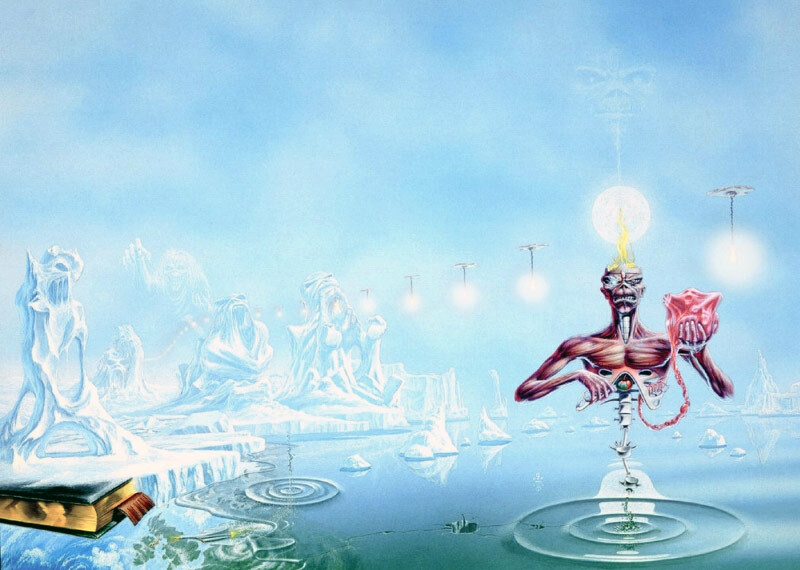 They concluded the decade with a masterpiece – Seventh Son Of A Seventh Son. Our previous retro review discussed what this writer perceives as a slight drop in the quality of the songwriting on the Somewhere In Time album, with singer Bruce Dickinson’s lack of enthusiasm and contributions a particularly troubling sign. Click here for our retro review of Somewhere In Time (1986)! But one need not have worried. Opening with the haunting strumming of an acoustic guitar and the nursery rhyme of «Seven deadly sins, seven ways to win…», Seventh Son Of A Seventh Son sees the band on top form. Iron Maiden, on top form in 1988. The sonic experimentation that began earlier with the Somewhere In Time record, blossoms here into what is possibly the most cohesive and epic album the band would ever make. If Killers (1981) and The Number Of The Beast (1982) are sister records, and Piece Of Mind (1983) is partnered with Powerslave (1984) in the same way, Seventh Son Of A Seventh Son has several sonic attributes in common with its predecessor. The proggy arrangements of some tracks, and the addictive hooks of others. Addictive hooks: First single Can I Play With Madness sticks in your head. The sound is layered with thick guitars courtesy of Dave Murray and Adrian Smith, while never allowing Steve Harris’ bass to fade into the background. The synthesizers still figure, as in the majestic intro to Smith and Dickinson’s sinister album opener Moonchild, but the keys seem somewhat better adjusted to the classic Maiden sound than on the previous album. When the opener gives way to Harris’ otherwordly Infinite Dreams, one of the greatest Maiden songs ever to disappear from live setlists, the album really hits its stride. The classy songwriting continues in the shape of the singles Can I Play With Madness and The Evil That Men Do, crowd-pleasing numbers that build on the foundations Smith laid down on Somewhere In Time, but add the quirks and signatures of Dickinson and Harris. Serious vibes as the classic line-up deliver their final album together, A Particular Kind Of Jeans. Kidding. It was Seventh Son Of A Seventh Son, and the 1988 jeans wearers left to right are: Dave Murray, Nicko McBrain, Bruce Dickinson, Steve Harris and Adrian Smith. Indeed, a central feature of the album is the fact that the songwriting has not been this integrated since Piece Of Mind. Amazingly, Seventh Son Of A Seventh Son is this line-up’s fourth studio record in five years! 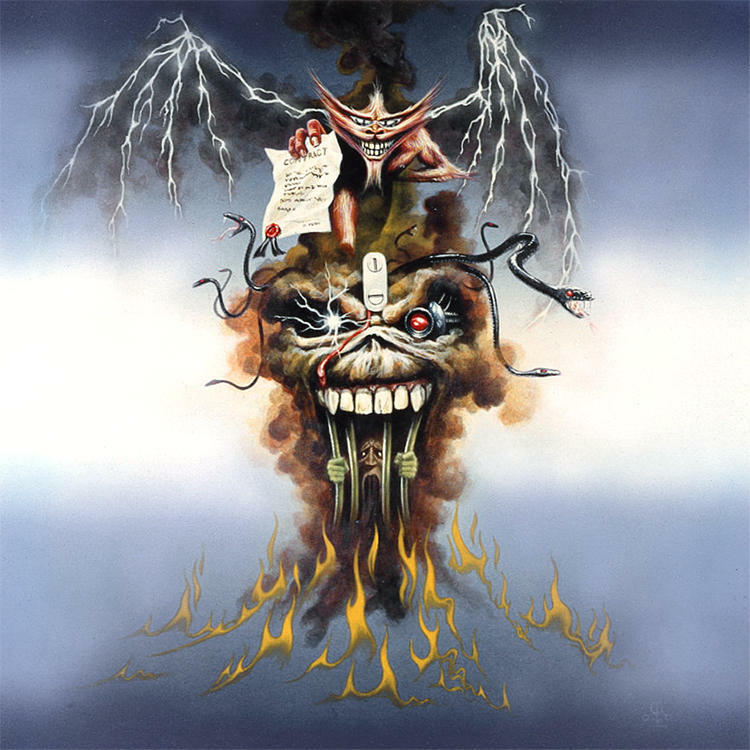 If you add Live After Death (1985) into the equation, Iron Maiden have released a total of seven studio records and one live album in eight years, all of which score 4/6 (Good) or higher in this reviewer’s opinion. Seventh Son Of A Seventh Son is their crowning achievement. The overall vibe is not as stiff as on the previous record, the band seemingly more playful and inspired. Dickinson’s singing sounds firmly present once again, and he also co-writes the excellent and underrated album closer Only The Good Die Young with Harris, the track that tops our list of deep Iron Maiden cuts. Murray and Smith keep up their tradition of delivering faultless guitar work, both acrobatic and atmospheric, with the Murray and Harris-penned The Prophecy being a prime example of the latter, oscillating between anxious melodies and Black Sabbath-like muscular riffs. The vinyl picture disc re-release did unfortunately not take full advantage of the Riggs artworks. The gatefold opens to reveal shots from the 1988 Seventh Tour Of A Seventh Tour, while the picture disc is decorated with Riggs’ artworks for Can I Play With Madness and Harris’ stadium-sized The Clairvoyant. Which is all as expected. Why not drop a band picture or two (in particular the one from 1985) to include these awesome Seventh Son era artworks? At least the 2014 black vinyl reissue stays true to the original 1988 packaging. Time would show that this album project was the last great work Riggs did for the band, having taken Eddie to the very limits of existence from where there was really nowhere to go. And Riggs would never again have such magical music and lyrics to provide the basis for visual creation. Not only is the playing some of Maiden’s best ever, with Nicko McBrain’s masterful drumming pushing on and holding back with faultless precision, but the songwriting shines. As this earlier Maiden Revelations feature argues, Seventh Son Of A Seventh Son is one of those great metal albums that came out at a time when metal was about to go through a painful transition into the 1990s. From this point on, Maiden’s star would be in descent, but the 1988 album shows them at their very best. Click here to read about the end of Iron Maiden’s classic era! Harris himself turns in his best work since Powerslave with the aforementioned Infinite Dreams and The Clairvoyant, as well as the title track. Trying hard once again to compete with Rime Of The Ancient Mariner of four years earlier, Seventh Son Of A Seventh Son is Harris’ second best epic ever, and even gloomier than its predecessor. The album might be Maiden’s heaviest and darkest yet, with all the songs sitting well with the Seventh Son subject matter that initially inspired the writing sessions. In fact, Seventh Son Of A Seventh Son is Maiden’s first and only concept album, with all the songs relating to the drama of the life and death of the psychic title character. The album does not present a narrative, like Queensrÿche’s awesome Operation: Mindcrime which was released the same year, but in a sense it’s a relief that the story behind the music is more free-flowing and less scripted. The subsequent tour was the last of the monumental 1980s stage productions and spawned the classic Maiden England concert video. 25 years later there was also finally a proper live album available with the restored and remastered Maiden England ’88. It’s simple: By 1988 Maiden seemed to be acutely aware of the musical legacy they had built, and they also seemed to know how to keep building on it. It was therefore a bit of a surprise that the band chose to change direction quite radically for their Seventh Son follow-up in 1990. Click here to read our review of No Prayer For The Dying (1990)! As a capper to the 1980s, there is no fault with this record. Seventh Son Of A Seventh Son is a masterpiece that rounds out a decade of music as close to perfect as any metal band will ever get. The best heavy metal album of all time. Seventh Son of a Seventh Son is absolutely perfect in every way and no other album will ever come close, let alone surpass, this classy masterpiece. Good to read! Speaking for myself, and keeping to the retro reviews intention of using all of the scale, this album is one of two masterpieces beyond argument in the Maiden catalog.